Here is a quick sneak peek of what I’m working on right now, along with an invite to come see it in action. The Portland Art Museum is partnering with Piano! Push Play! to create an installation of 10 designer pianos, which will be featured in a concert on June 26th at the Museum. From there, the pianos move to various sidewalk and park locations to be played by passers-by for a few weeks before they are donated to schools, community centers and other organizations unable to purchase pianos on their own. 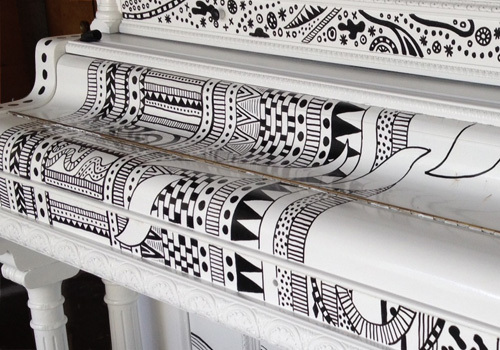 That’s right, I’m painting an entire piano for anybody to play. Check out the event on Facebook for more details. As a native Oregonian who grew up on the east side where tumbleweeds blow and it took an hour to drive to the “local” movie theater, Portland was the mecca of civilization. Malls, stoplights, and my grandma’s house were all big city attractions that wowed me during childhood visits in the 80s and 90s. As an adult I moved to Portland after getting degreed to chase the creative dream. So far so good. After a solid stretch in Portland, I moved to Copenhagen Denmark for a few years. When I returned to Portland, my memory of the up-and-coming town was forced to reconcile with all the changes that had occurred while away. 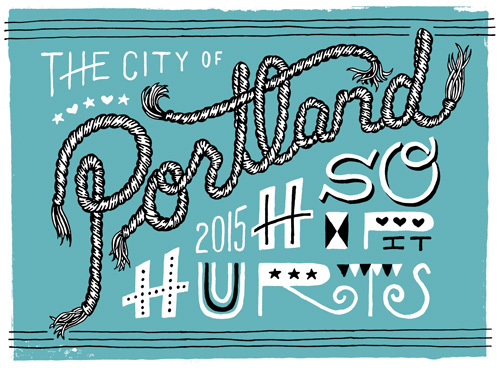 Now, Portland was…hip. So, so hip. It was no longer just a simple place to be, but self aware. So here’s a typographic ode to my burg that has changed so much over the last 3 decades for good and for bad. I still love you Portland, just please don’t get too big for your britches. 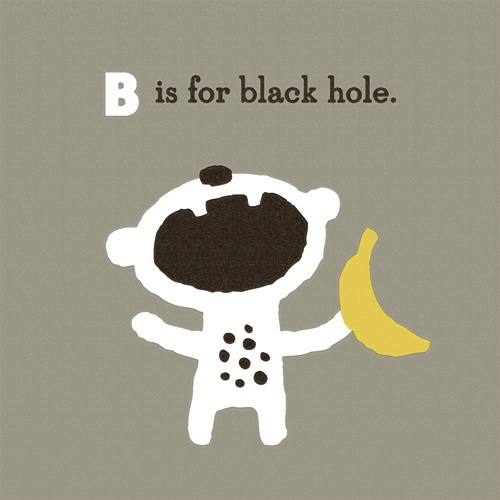 “B is for Black Hole” is part of an on-going alphabet series for kids using math, science and geography vocabulary. Have an idea for a good word? Send it my way! 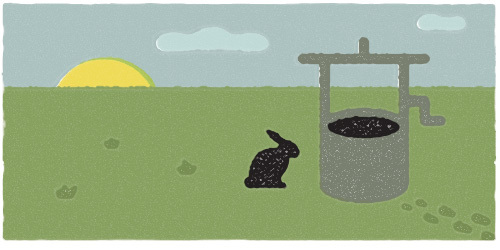 Here is a third test in drawing animals in a ‘teardrop’ style. Previously I tried out various birds, plus a rabbit, skunk and porcupine. 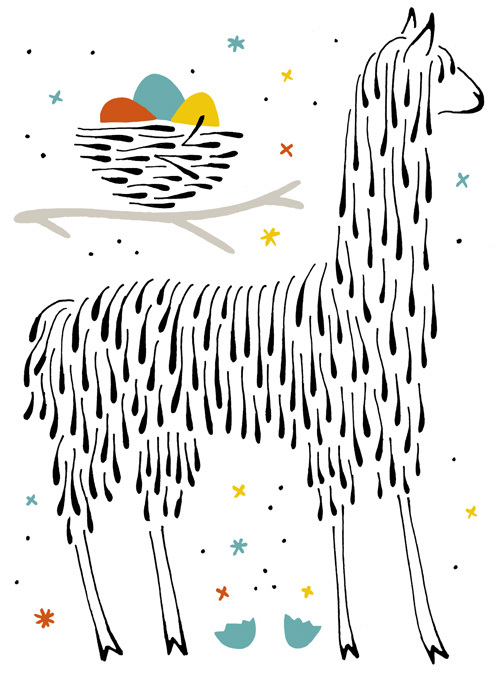 I’m not sure if llamas can actually lay eggs. Maybe they just guard them for birds who are on a trip to the worm store. But somebody is bound to get a talking to when the creature in charge gets home.